Susana Villarán is the former mayor of Lima, the capital city of Peru. At the national level she has been Executive Secretary of the National Coordinator for Human Rights of Peru (the umbrella organization for human rights groups in Peru), and the Minister of Women’s Affairs and Human Development during the Transitional Government. From 2002 to 2005, Susana served as an elected member of the Inter-American Commission on Human Rights at the Organization of American States. In 2008, she was elected by the United Nations General Assembly as an independent expert on the Committee on the Rights of the Child. 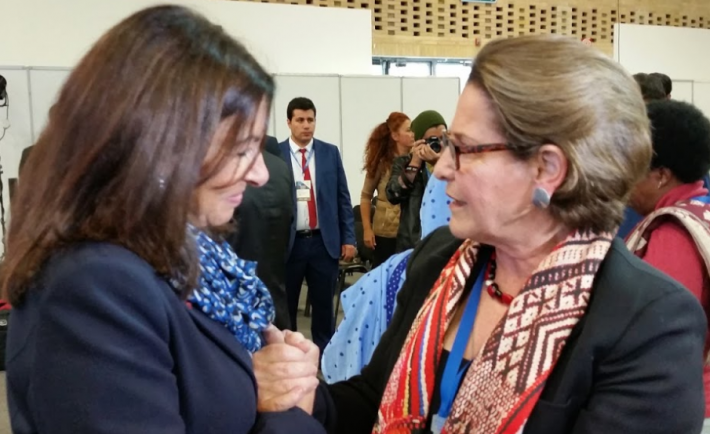 Susana Villarán (right) speaks with Anne Hidalgo, mayor of Paris, at the United Cities and Local Governments World Summit, in Bogota (October 2016). "The world is not built or transformed without half of humanity, and because it is so difficult for us as women to achieve power and at the highest level in our cities, our commitment is to transform them," said Anne Hidalgo, mayor of Paris, at the United Cities and Local Government World Summit. Our delegation -- composed of women mayors and social leaders convened by the National Democratic Institute -- had the objective to radically deepen the gender perspective and the policies in favor of the rights of women living in cities embodied in the 175 articles of the New Urban Agenda (NUA) approved in Quito by the member states of the United Nations.